Sugar cookie trees are a fun and easy winter treat that kids love to stack (and eat). I love, love, love making elaborate cakes and treats, but sometimes I just want to throw some cookies on a plate and still have it look seriously impressive. These cookies are as easy as 1-2-3 (4-5-6-7-8...), and can be frozen ahead of time and plunked on a dessert table at your big holiday family function. Ready for the details? I made these with flower shaped cookie cutters, and stacked 1-2 per size to get the shape I wanted. You can use any shape you'd like, from circles to stars, to get other cool looks. For the tree stump, I used a slightly flattened 1/2 inch piece of Tootsie Roll (lifted from my boy's Halloween candy stash, natch), but you can also use a Rolo, or chopped up chocolate bar to get a similar effect. Preheat your oven to 350F and line a baking tray with parchment or a silicone baking mat. Roll out half of the dough onto a clean, slightly floured surface, about 1/4 inch thick, and cut an equal amount of each cookie cutter shape. Repeat for the remaining dough, using up any scraps as you go. Bake for 10-13 minutes. Remove to cool on a wire rack. When cooled, stack the cookies from widest to smallest, and place on top of a slightly flattened piece of Tootsie Roll. 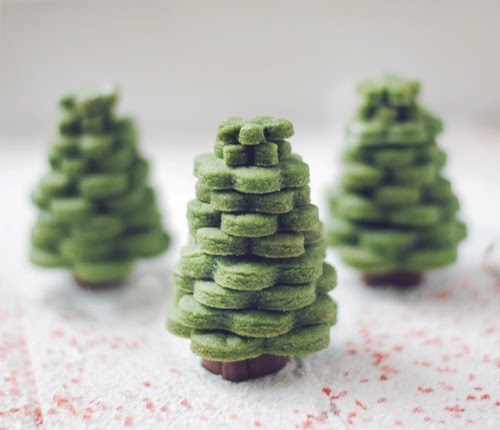 To make the trees a little more stable, you can put a dollop of icing or melted chocolate between each cookie layer. I opted not to, since I didn't want my family to each a whole tree each! To finished them off, sprinkle with icing sugar, if desired.